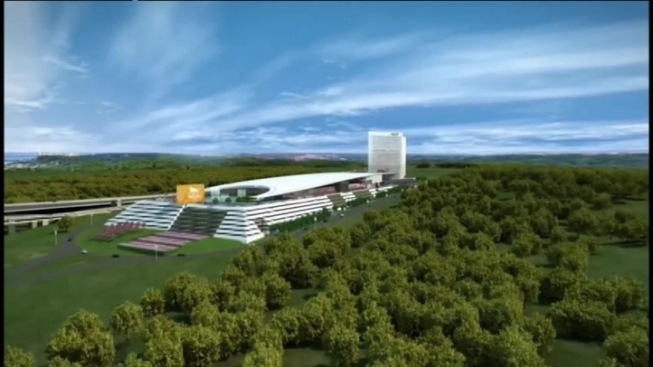 The third and final pitch for a casino in Prince George's County was presented by MGM Grand Friday. MGM Grand is proposing a 23-acre site on the banks of the Potomac River that would generate 7,500 jobs. MGM CEO James Murren promised the Maryland Video Lottery Commission a sizable revenue from the casino would go back to the Prince George's community. Murren also announced a partnership with Lanham-based Radio One. "We have never seen a site more perfectly suited to an international destination," Murren said. The $800 million casino would have views of the monuments in D.C. due, in part, to its height. The building will span more than 1 million square feet. The casino will also feature high-end shops like Tiffany and Co., Hermes and Prada. A fountain out front will also serve as a ice skating rink in the winter. Penn National Gaming and Parx presented their plans for the casino earlier this week; Penn National promised millions of dollars going back to the new Prince George's Hospital satellite neighborhood health care system while Parx promised millions in road improvements. Community members in all of the proposed areas for the casino are weary. "I read the paper every day and I see what they're proposing," Oxon Hill resident Beverly Motter said. "Whether they live up to it 100 percent, who knows?" The Commission will make its decision before the end of December.